Go on a puzzle-solving Mahjong adventure and recover your lost artifacts. 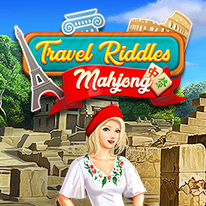 Travel Riddles: Mahjong takes you on a puzzle-solving adventure around Europe. Set out on your fantastic journey through France, Italy and Greece right now. Enjoy beautiful locations and atmospheric music. Have fun and gather a complete collection of artifacts. Objectives vary from level to level and pieces are arranged differently every time you replay it. Finding all the required pairs without being blocked is not easy, but you can always use helpful powerups to solve even the trickiest layouts.